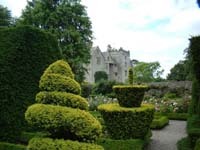 Levens Hall, medium sized hall at the southern end of the Lake District. 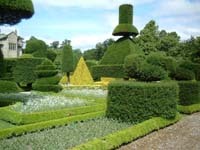 Famous for its topiary which is over 300 years old. 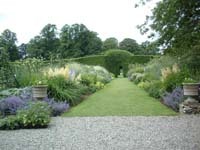 Lots of flowers, fine borders, ornamental and vegetable areas. 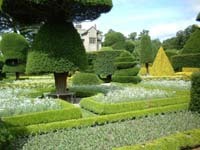 The garden leads through a number of sections; fruit and vegetable, water and fountain, floral, topiary. Entrance to garden, house or both. Cafe, meals. 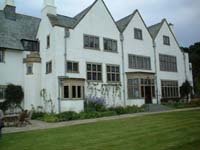 Blackwell House, near Bowness. Former Manchester cotton mill owners country house, then preparatory school, now an Arts and Craft movement display house. Not a lot in the house, in my opinion but my wife thinks it's great, the decoration is Arts and Craft. Garden overlooks Lake Windermere, nice modern stylish cafe. Blackwell House overlooking Lake Windermere.